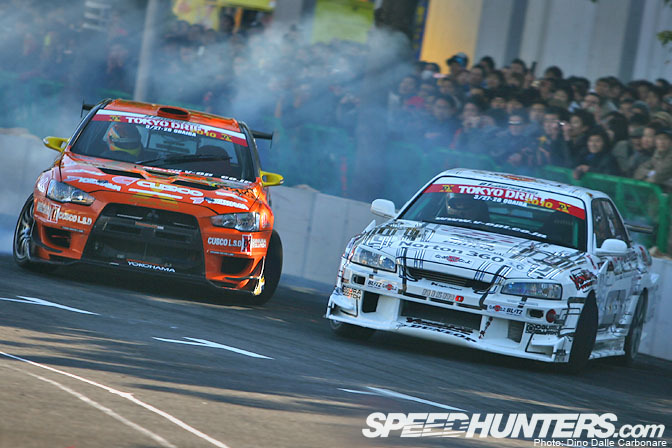 You really can't go wrong with a bit of drifting that's for sure! 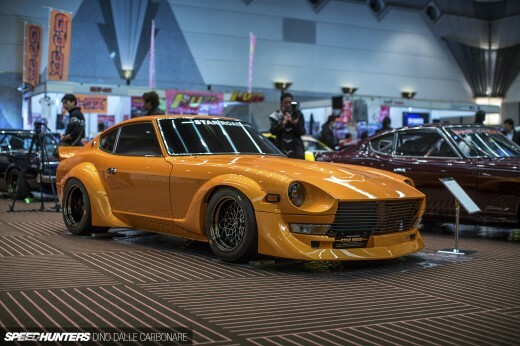 The D1 crew were out at TAS with their cars putting on the very popular drift exhibition that has been a big hit since it started in 2008. 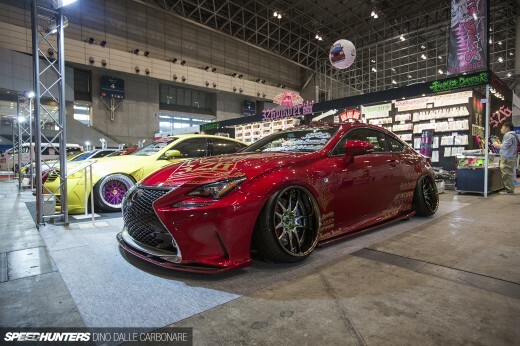 The sunny weather made it a pleasurable way to take a break from the dark and overcrowded halls of the show, checking out Japan's most famous drifters in action. 2010 also marks the 10th Anniversary of the D1 Grand Prix so the organizers were giving away special commemorative stickers to the fans. Mine went straight onto my camera case! We saw the guys at Team Orange help Tsuchiya lay out the track on Thursday on the set-up day post, and by the looks of it by Friday everyone had gotten tons of practice in as the parking area used for the event was covered in a thick black layer of rubber! As the crowds continued to grow around the make-shift drift course the drivers lined up their cars ready to get the action started. 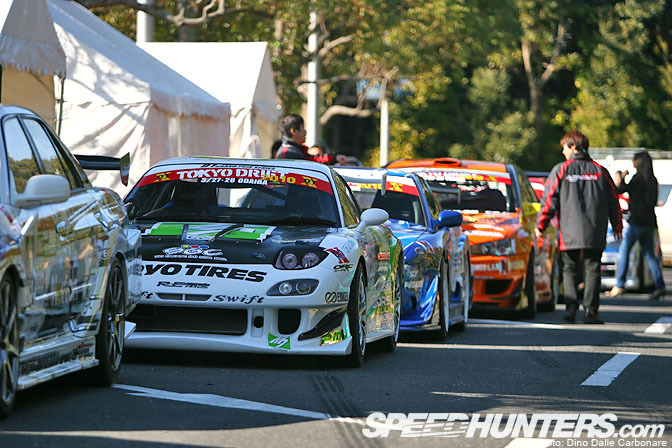 You can see Russ from RE-Xtreme on this shot making his way back to the side of the "pits" after taking a closer look at Suenaga's RE-Amemiya FD. Damn rotorhead! 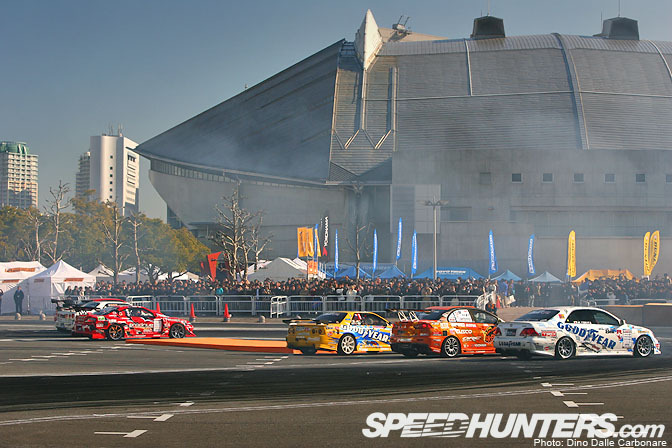 That is the Makuhari Messe Arena behind all the tire-smoke! What a backdrop! 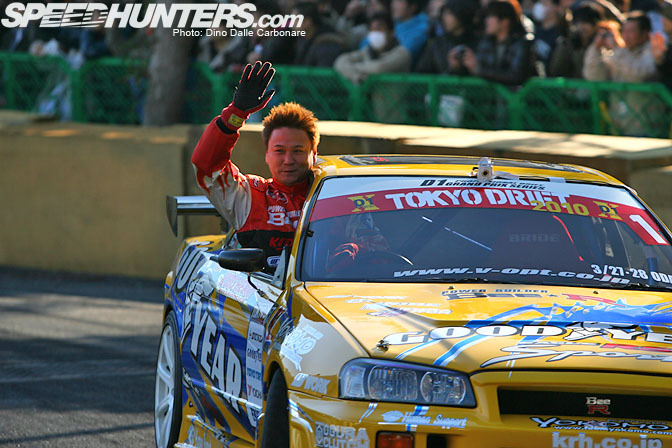 2009 champion Imamura will be trying his best to hold on to his title for 2010, but competition should be tougher than ever! 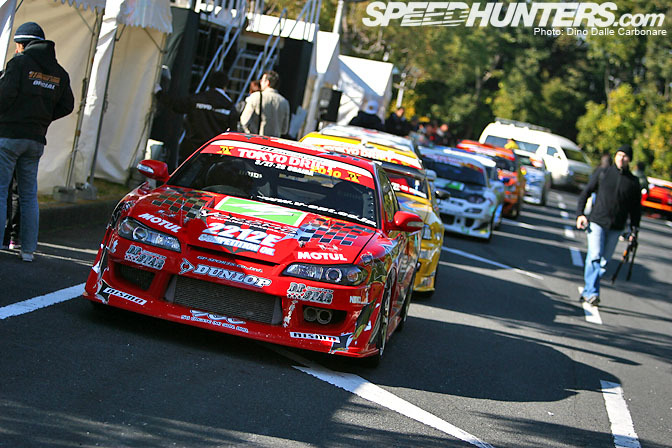 The first round of the 2010 D1 season will be held in Odaiba (Tokyo) at the end of March, as you can see on the windshield banner of each car. I would be very happy if Tezuka manages to grab the title this year, he did a great job in 2009 and came so close with only 8 points separating him and Imamura. …before heading out to shred some tires. The course was very tight but most of the drivers were coming around the main corner in third gear. 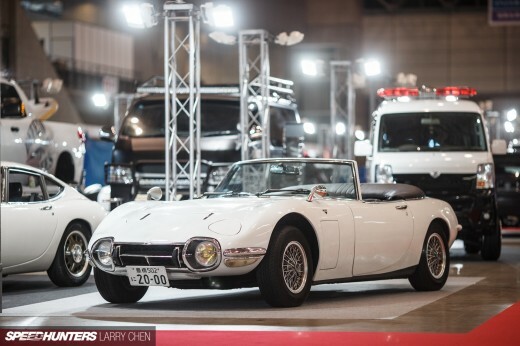 Don't you just love those police lights behind the grille of Tokita's Corwn! I can't wait to see Kumamubo's new D1 monster-machine. Koyama-san (aka God-Hand Koyama) of Koyama Racing Labo is currently building his 1200 HP Nissan Laurel, which will replace the Evo X sometime this season. 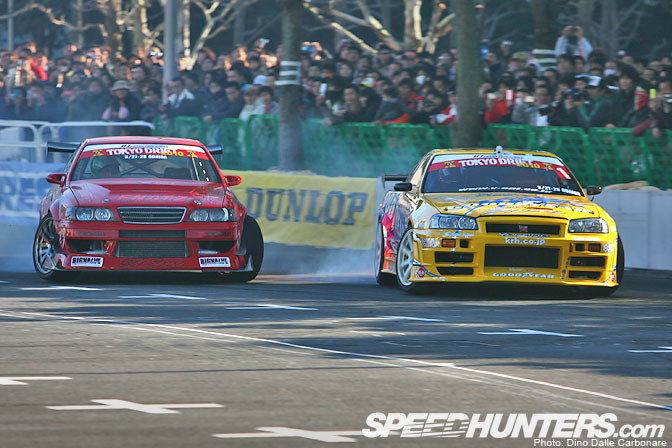 …Saito was trying to get his big JZX100 to swing around the tighter corners. GP Sports sure do make an awesome kit for the 180SX! The price must put a lot of people off as I've never seen a street car fitted with one. 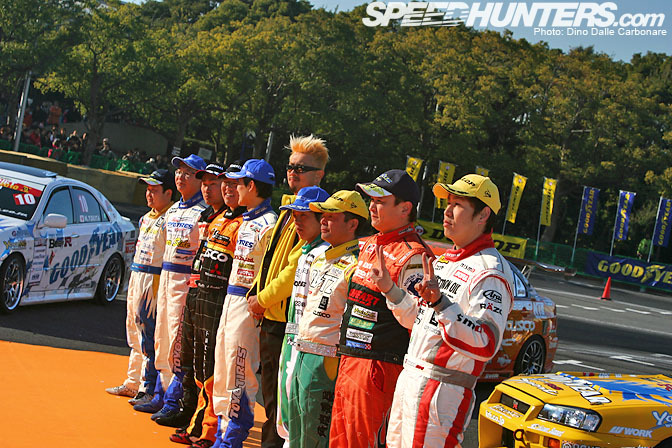 …the drivers lined up once again for a few pictures. Nice subtle plug... I've finished the FD side of my posts. Sorting through pics is a rectal adventure. Nomuken realy needs a new platform, that ER34 is just overdone! The last season it looked good was around 2007.
man did i call it or did i call it??!?! i said it would be either an aristo or a laurel. 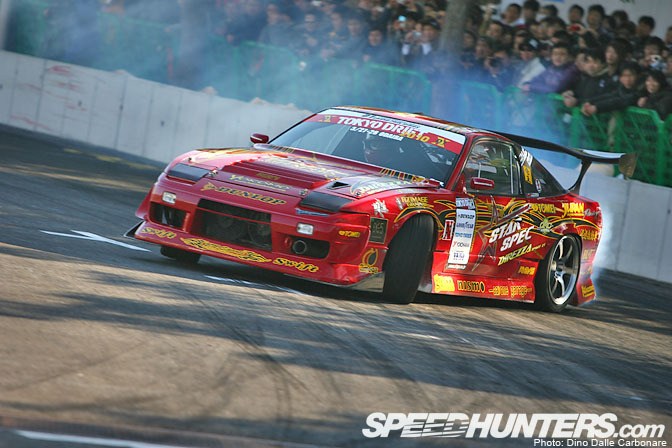 Is it just me that thinks the GP sports kit on that 180sx is way too fussy and over designed? It just spoils the lines of the s13 imo, especially the rear quarters and bumper. 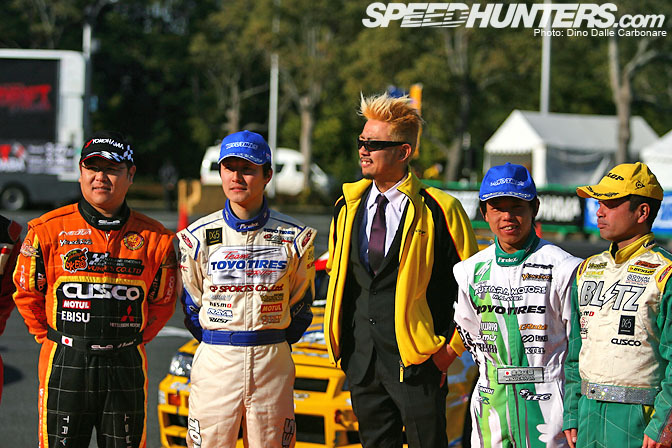 Look at it in comparison to Koguchi's car which looks spot on to me. 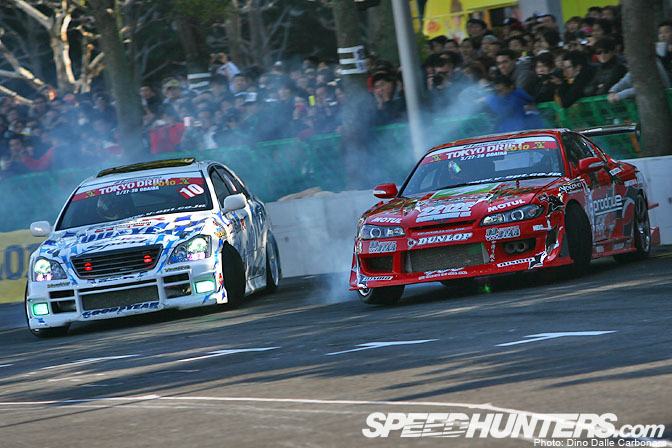 Maybe the reason you dont see the gp sports kit on the street is due to the fact that street drift cars tend to be simple and smooth. So, they do this every year now at TAS? Because that's even more reason for me to go, ha... Love it. So much to see and so much to speculate here. Dunlop sponsoring Imamura!? I think that they got tired of Nomura's do good for a while and consistantly fall back style. I still support him, just not as much as I used to. Consistinany is what's going to win a championship title. If Nomuken doesn't make a good show this year he's out of the Dunlop camp next year. Made me lose faith in BLITZ too. I'm all GReddy and TRUST now. BLITZ needs to get of their lazy but and get that R35 project sliding! And maybe Hibino will get fourth this year. I thought I saw you out there snapping away. We were lucky enough t be allowed to film it for a DSPORT DVD and Motive DVD feature. Woah, what? They're already retiring the Evo X? 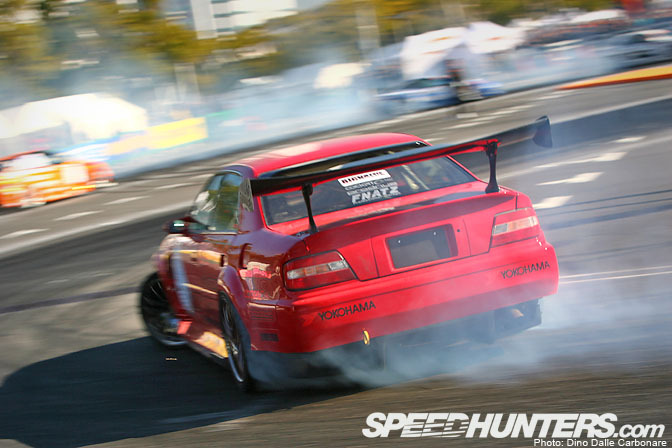 Damn, 1200HP drift car will be something to look out for. dunlop on Imamura, whaaaaaaaaaaaattttttttt?????!!!!!!!! he should be sticking with the potenza re-11 as its a really good tire!!!! !